I hope you all enjoy our day through some of our favorite wedding photos as much as we did that day. To see more of our day, check out GraceFulfillingLife on Facebook. In honor of a new beginning for our blog, with our new name.. GraceFulfillingLife.com, we thought what better way to start then to start sharing our wedding day with all our readers. 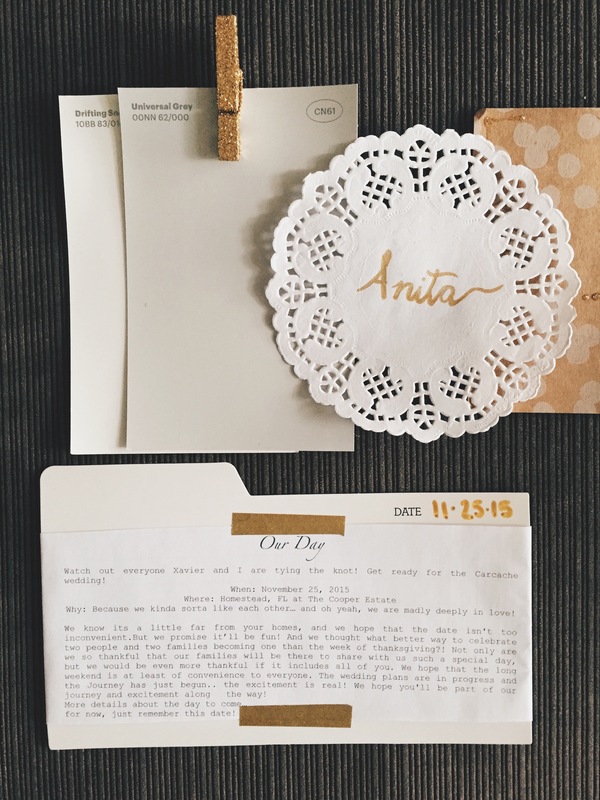 Before we decided to make the change, we had been sharing part of wedding plans leading up to our big day! (refer back HERE to see a couple!) We are so excited to share with you all the many DIY’s that went into making our day, a day that was perfect for us and that will forever be in our memories and hearts. When Xavier and I got engaged and our wedding plans started, we knew things we wanted and did not want. We knew that we wanted an intimate wedding with our closest friends and family and we wanted it to be about us and not about the wedding in itself. We felt the setting of our wedding had to reflect who we are and the feeling we wanted for that day. It needed to be personal and we longed for a romantic and genuine feel. We wanted to be true to who we are and our faith and have those feelings be reflected. We also did not want to spend a fortune either, so my handy DIY skills and creativity and a whole lot of pinterest came in handy! A lot of the pinterest ideas we saw, we tried giving them our own personal twist in hopes it would reflect us! We decided first and for most that we did not want a hotel nor a banquet hall setting. For me especially it was important for me to feel relaxed and to feel the calmness of nature around us. And let me tell you this.. the weather was perfect. There was a sense of calm to a lovely cool breeze that day and a natural light so wonderful that all I could think was.. “goodness..God’s presence is truly with us today” and to me that was an unforgettable feeling. Our theme.. well we really didn’t have one.. we just knew that our colors would be a light grey, white and touches of gold and greenery! Our flowers were a big part of that theme, they were simple, white and elegant. Did I mention they smelled lovely because they were full of seeded eucalyptus?! The best part of the flowers is that we found a wholesale florist who actually made all our arrangements! So our theme was just for it to be romantic, simple yet have a touch of rustic elegance. So whatever looked pretty, was on sale and I could find something to do with it, it was on our ‘to do’ list. Our DIY’s included some of these lovely pieces..We used a lot of re-purposed wood that my amazing handy man dad was so gracious to find for us for the aisle boards and I got to staining and using my “wanna-be” calligraphy skills. We also used smaller sized ones as table numbers. All our chalkboard’s I found at Michael’s arts and craft stores and I never bought one that was not on sale! win! Our seating chart/Polaroid exchange station was an activity that we did in exchange for a fancy expensive Photo Booth! if you can afford it, they’re fun but it was definitely not in our budget. One of our favorites was being able to have Xavier’s cousin Cristina who is like a super amazing artist draw us the tree we would marry under and make it be our sign in “guest tree” with fingerprints! And who doesn’t like a good drink in a mason jar while doing it right? For our ceremony back drop it was all about simplicity for me, the venue was already so beautiful that it didn’t need much. It conveniently had an amazing swing that was perfect for our back drop. I made the fabric banner myself and the YOU and ME sign I found at Michael’s and spray painted it gold, because anything I could spray paint gold…well I did. For our ceremony we opted out on the unity candle and the typical unity sand sets.. Before Xavier and I got married we went through pre-marital classes and one of the basis of many of our teachings was the verse, Ecclesiastes 4:9-12, a reminder that we have entered a commitment between Christ, Xavier and I. So we decided on braiding it, with The cord of three strands. I had seen many on easy pre-made but figured I could do it myself for half the price, and I LOVE how it turned out! We now have it in our room and its a constant reminder to keep Christ as the center of our relationship. Our wedding cake topper and peg dolls were one of our favorite! In the beginning of our engagement, I had been following Goose Grease Shop on instagram, a fair trade company making custom peg doll cake topper’s made from local artisans in Colombia. One day they had a giveaway and I immediately signed up and turned out winning the giveaway! It was exciting for me because it was a unique way to incorporate a little piece of where I am from too, while doing what I love…arts and crafts! So long behold, the lovely peg dolls made an appearance on our cake along with a love sign that I of course painted gold! And the most exciting part was… How it all came together. Made with love and wonderful memories..
We couldn’t be more happy to share such a special day with you all, we are looking to sharing the rest of our day with you all, stay tuned for more of our photos and story! We could not have had such an amazing day if it wasn’t for our amazing family and friends for all their help! We will forever be grateful. Hope you all enjoyed the first sneak peek into our wedding day! Feel free to ask any questions you all may have.. we are happy to answer! 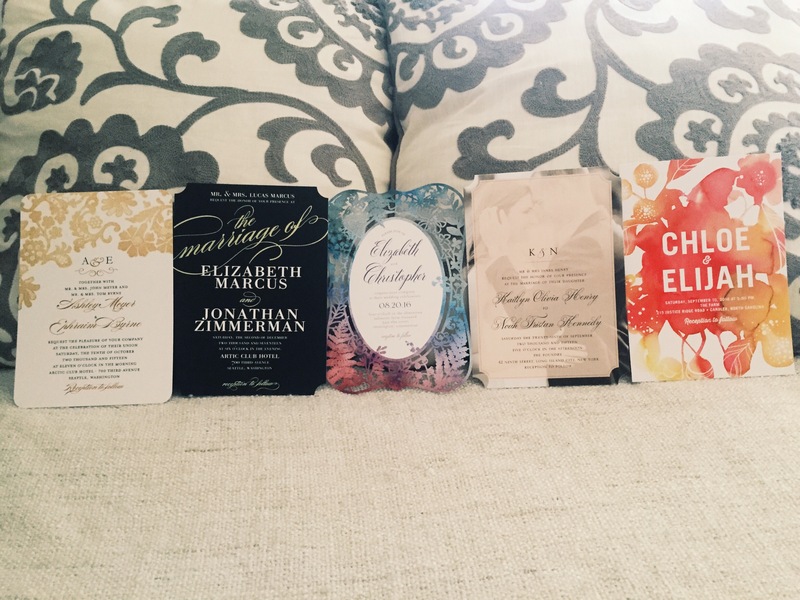 Today on Wedding Wednesday, it’s all about a little DIY for my Bridesmaids. I was very excited once I knew how I wanted to present my idea, that’s why I decided to share with you all, how I asked my girls! For those of you who have been following my blog, you all might know that I’m all about DIY and creating goodies and cute decor details. Asking my girls to be my bridesmaids would be no exception to the opportunity. So after some research and finding some cute ideas, I decided I wanted it to be personal. My creative side got excited and started going to my local arts and crafts stores like Michael’s, hobby lobby and one of my favorite places for small inexpensive goodies.. Target! Once I started visiting these stores I just began by looking around and just seeing what cute things I could find. I wanted it to be personal but not spend tons of money on random goodies either. So I picked up a couple of cute little pieces from wherever I found things and started my DIY! I spent time looking for things that would suit and go with our look for the wedding as well. Like mentioned before in my previous wedding Wednesday update, I’m trying to incorporate our colors and the feel we are shooting for that day! Simple, classy and personal. So away I went! The final product was definitely pleasing, personal and lovely! First thing I got to work on were these tiny little white totes.. I wanted to spark some interest to them and make them personal. I decided to get a dolly and place it on the tote and secure the edges down with some tape to prevent the dolly from moving. Once they were secured, I got my glitter fabric paint and traced the pattern of the dolly on to the tote and let it dry for only a few minutes to prevent the dolly from sticking to the tote. *Note..If you leave it to dry completely it will stick, if you remove dolly right away it may smudge the pattern.. so only let sit for a couple of minutes before removing dolly. 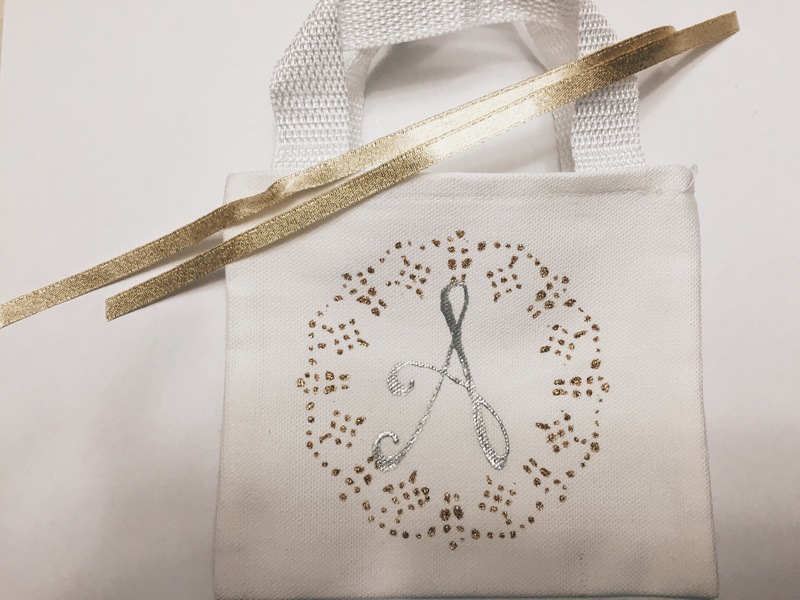 Once that dried, I wrote each girls initial on the tote… They came out better than expected! Next step was wrapping these up once they were dried. I decided to sneak in the travel size sewing kits in between since they were a little of an eyesore. They didn’t really go with the colors so I hid them in between and used the pretty gold ribbon to tie it all together. After those were done, I started gathering up all the other little details. 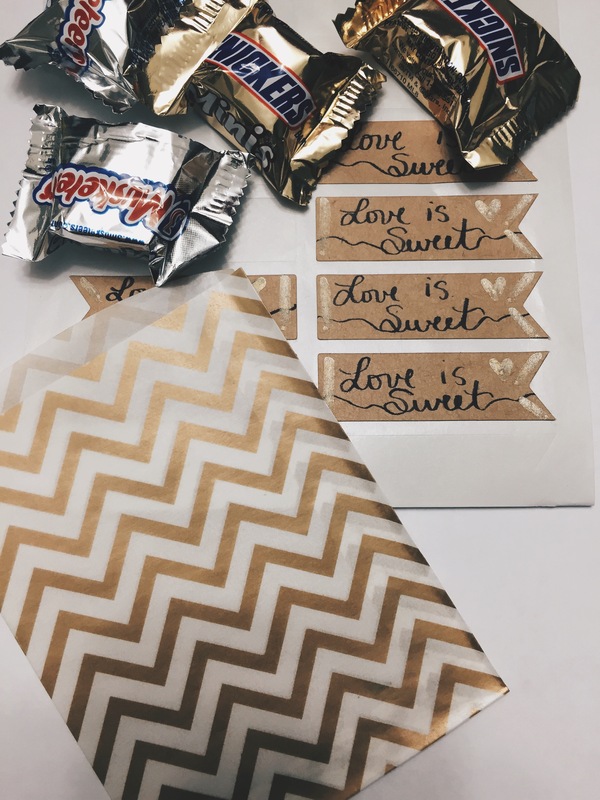 One was labeling those cute little chevron goodie bags with a little sweet note and putting some yummy chocolates inside. I used the extra dolly’s I had to label each gift with the girls names and taped the pictures to each individual magnet picture frame. Now for this handsome guy, he also asked his guys to be his groomsmen, only in a more simple and masculine way lol. We arranged some of these Cigars with their names on simple cardboard paper with a simple phrase printed on them, “Your service as a groomsman is required.” This idea we had seen on pinterest and felt it suited well! This Handsome guy was ready to pass out our bridal party gifts! 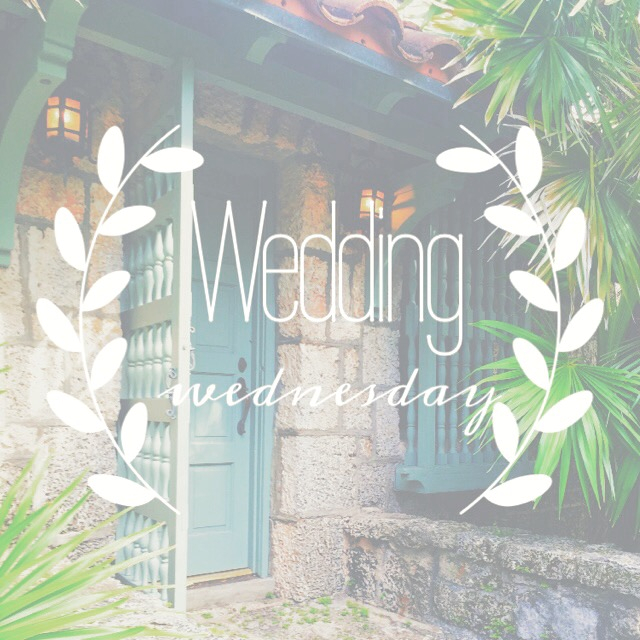 This Wedding Wednesday was a bit exciting for me to share! 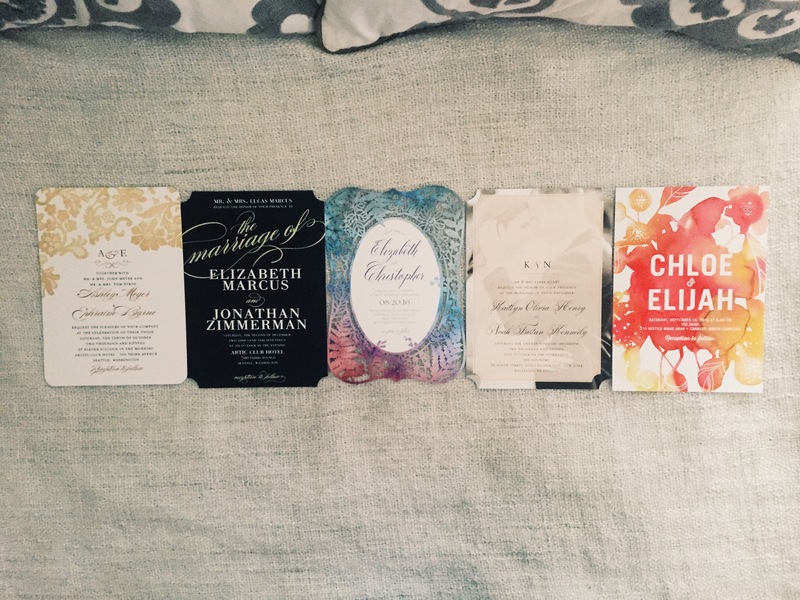 Our save the dates went out a couple of months ago, and although I’m a little late in sharing this, it was still exciting finding the pictures of these beauties to share with you all. As many of you know from prior post, I’ve been practicing some calligraphy on my free time. I’ll be honest, I haven’t picked up my nibs or my ink in a little while. But like I said, finding these pictures definitely sparked my interest once again to keep going and getting better at it! So what better way to share a new hobby with those whom are special to us and will be sharing our special day with us? Well.. By adding a little personal touch to our save the dates of course! I must say I was entirely excited for this project, it was two things that were special to me and I got to share them all at once! 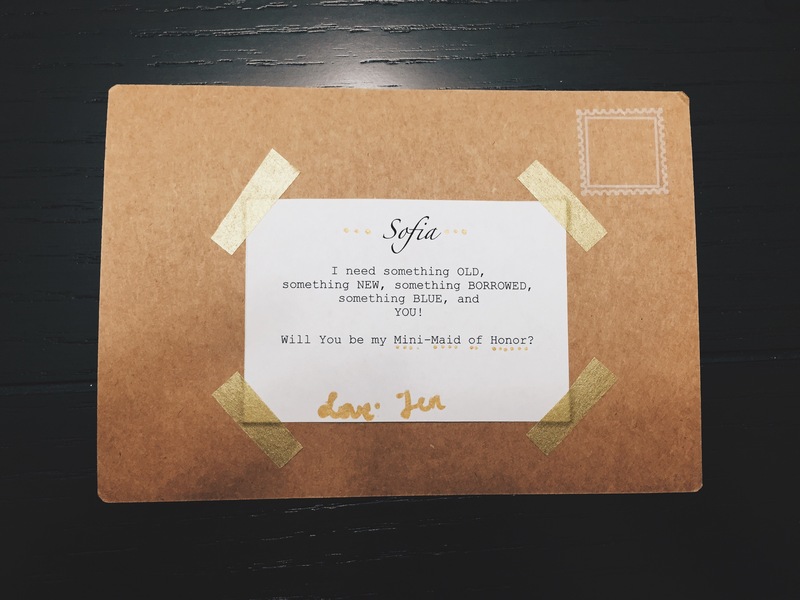 To begin with, what bride doesn’t get excited to send save the dates?!? Umm… I’d like to think all brides do! It’s such a special moment, knowing that you are finally able to literally share that date in the near future that will be one of the best days in your life! It’s a love filled announcement to all those special people who will be sharing with you that day. To me at least, it sounds priceless. So for me sending these out was a big happy deal and being able to personalize them with my own personal touch made it more special. 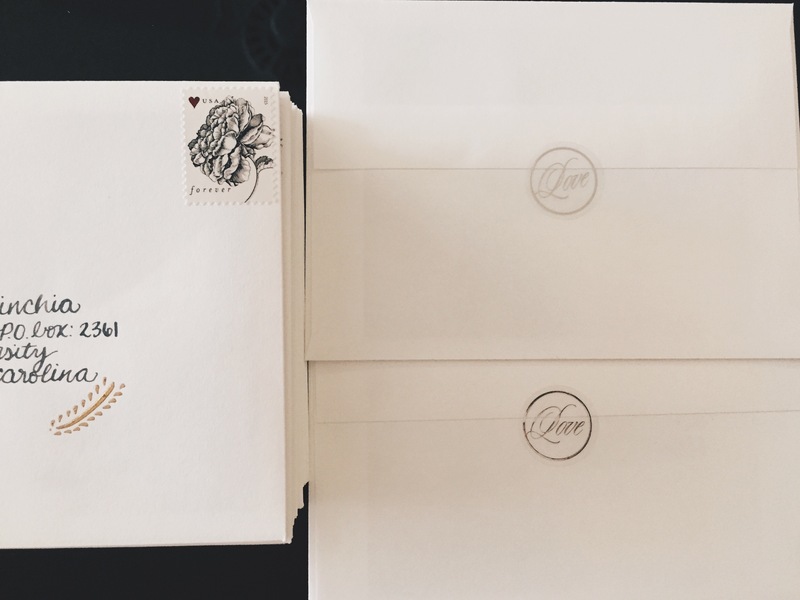 Xavier and I wanted to make sure we sent out something that said “us.” Our save the dates would have to be simple, clean-looking, yet classy and warm. So when picking the style for our save the dates, we made sure to find what fitted those wishes. I think we did a pretty good job at finding save the dates that defines us. 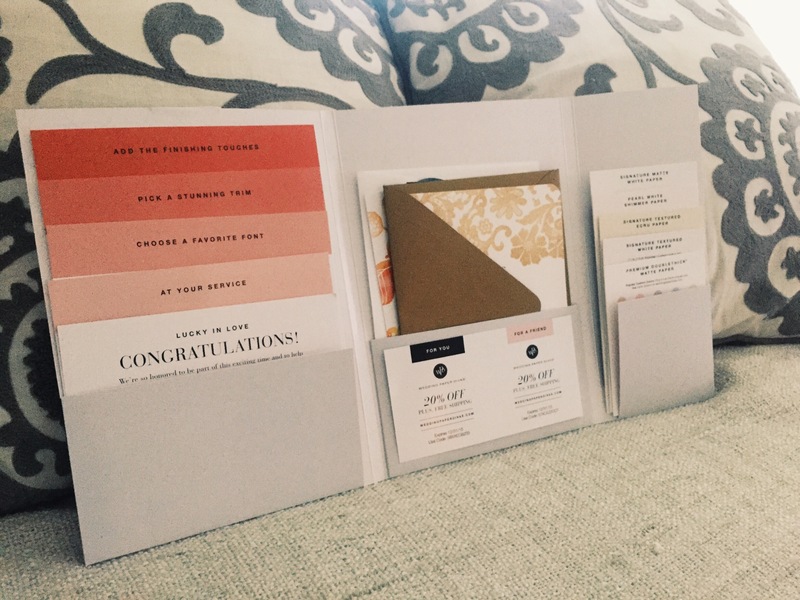 I also wanted to make sure that we brought in our wedding colors in some way and start to kind of give people the feeling of what our wedding day will be like. 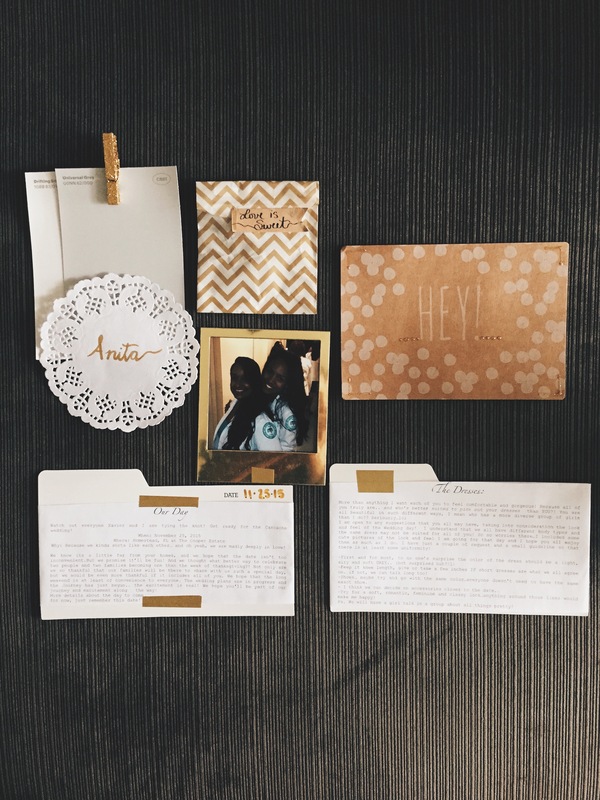 Grey, white and Gold were all incorporated and these simple yet classy save the dates from wedding paper divas suited us perfectly! We were very pleased with them and the quality and most importantly their price! They always have such good deals going on. Perfect for bride and grooms on a budget! 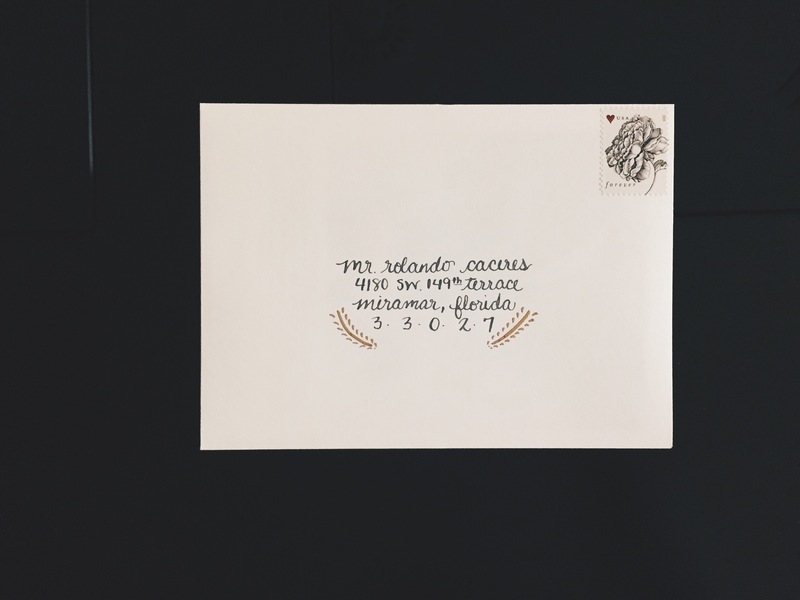 The envelopes were plain white but this is where I got to be creative and add that little personal touch with my calligraphy. A little flourish and some pretty handwriting and pretty colors did the trick! I was in love with them! We’ve gotten so many compliments and couldn’t be more happy with them! Hope you all enjoy them as much as we did. 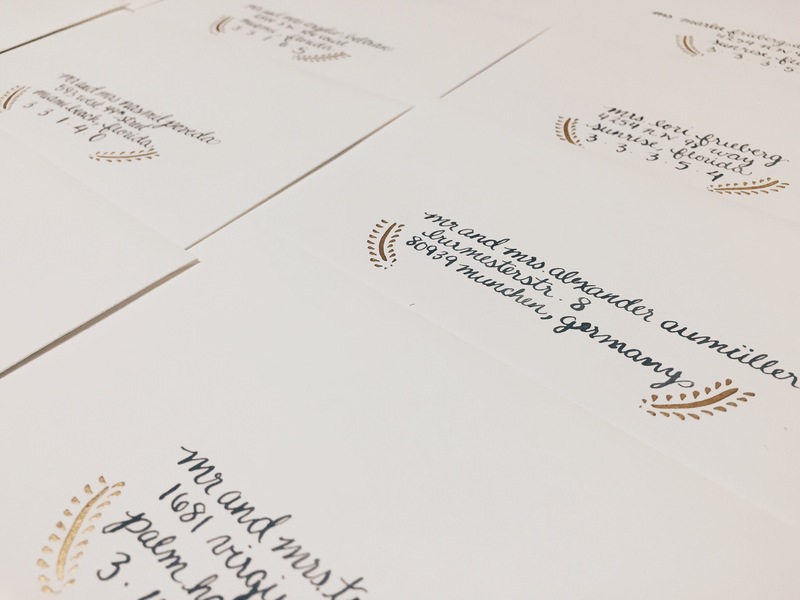 Some advice for your save the dates! 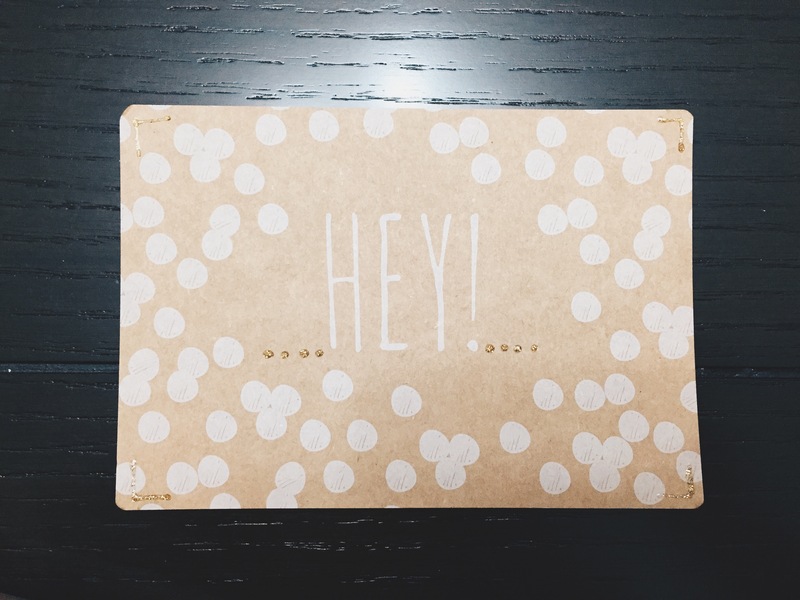 -return address stamps like our lovely stamp from littlemamapretties, will save your hand some tiredness and save you cash! Ordering return address labels can cost easily above $70 for maybe 100. Our pretty stamp cost us,$20. And we will be using it for our wedding invites later on! Score! -pretty vintage stamps are hard to find, and can add up as well. 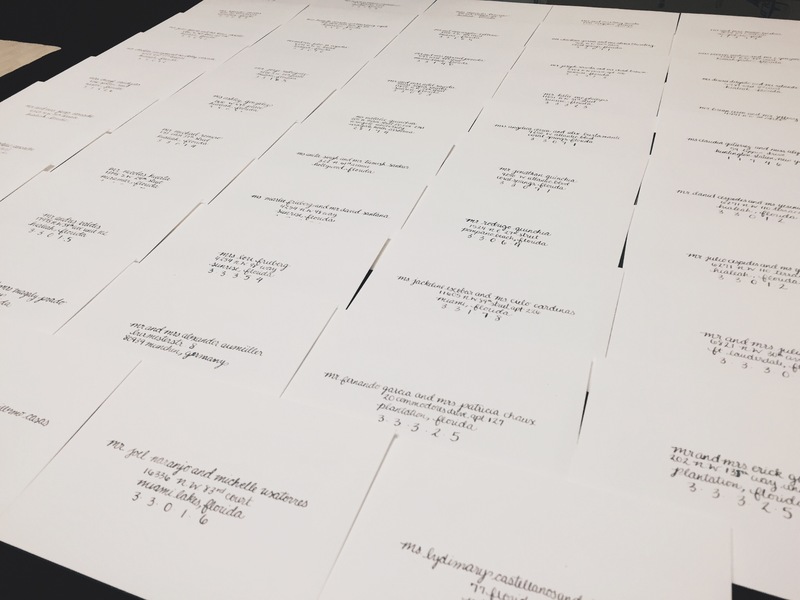 Your local US post office has a variety of wedding/love stamps for your occasion. 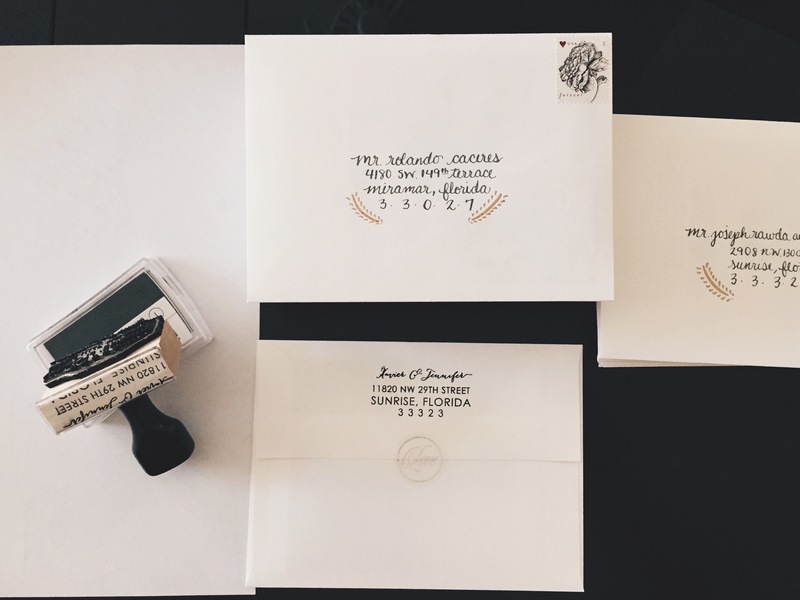 I loved our vintage like stamps we purchased at our local post office in sheets! 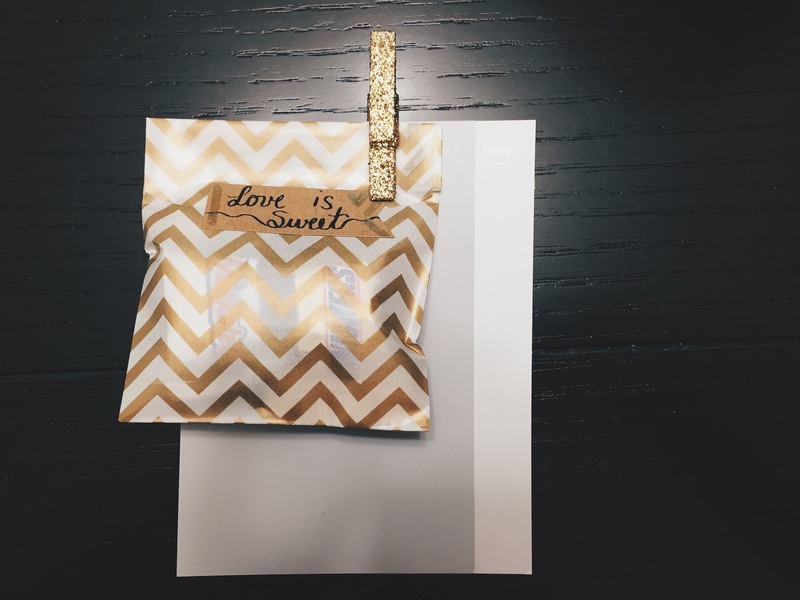 -envelope sealing stickers are a cute and easy way to spice up the look of your invites! We purchased our “love” stickers at our local Michael’s arts and crafts store for $5. -make a wedding website online for extra information for your guest and add your wedding website to your save the dates, people will have a good idea of the arrangements they will have to make and some sites even have RSVP options, we already have a couple and haven’t even send out invites! 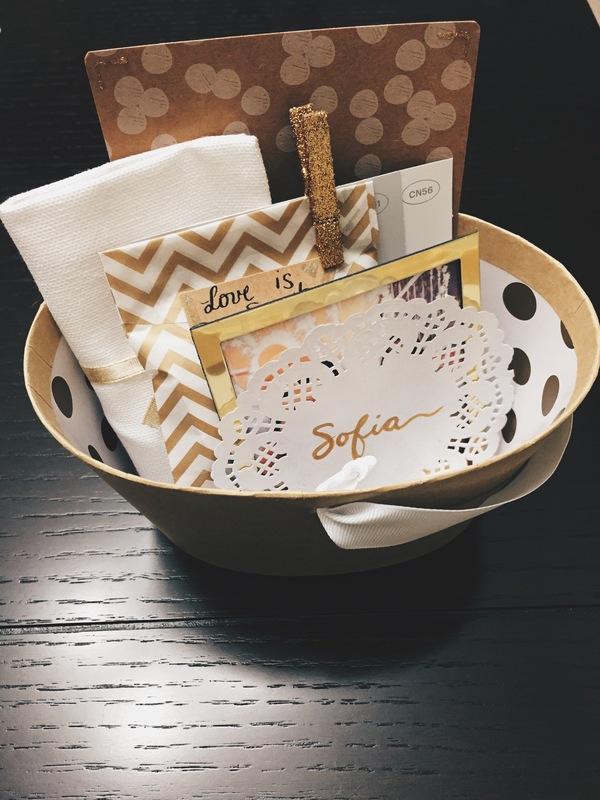 Did you personalize any of your wedding paper goods? If so, how so? We’d love to hear! 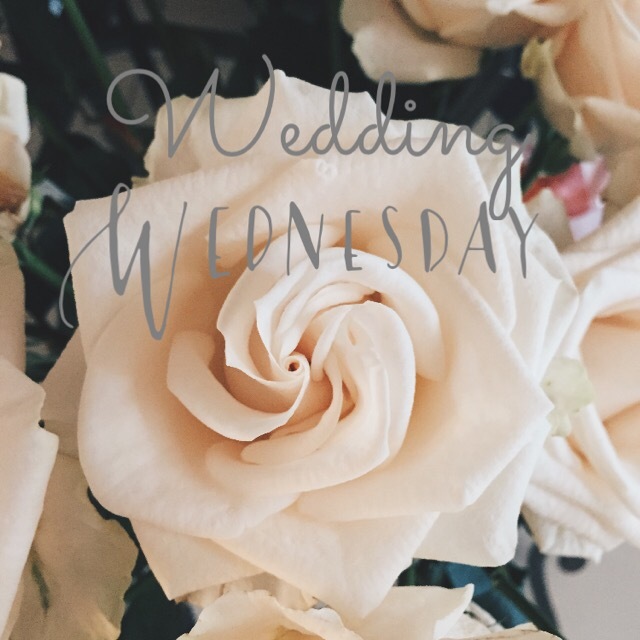 A Little Wedding Wednesday update today! We are officially at the 8 month mark and things have been steady as far as planning goes. The feeling of being overwhelmed has settled in comparison to the beginning of our planning to a subtle list of to do’s. I would be lying if I said that we don’t feel overwhelmed still, but I think we have a better grasp and understanding of the whole “wedding planning.” Little by little we have scratched things off our list and to be honest there’s one in particular that’s my favorite! But I will go into that in detail a little later! Just know it’s exciting! We have managed to have things under control for the most part so far. One thing that has gotten the best of me recently has been “color coordinating” something I never thought I would say, but it did, lol. We still have things to do and things to figure out, but it’s okay because I know that we can do it. We have really gotten a lot of the big things taken care of and now its seems to be coming down to the small things and small details. I have a lot of ideas running through my head and I can’t wait to actually be able to make them happen. For now, we will continue our steady pace and share with you what else we have crossed off our check list! Not too Shabby huh!? We have also done much more and if you can’t remember what else we have crossed our list, you could read bout it here. We are actually in the works of getting our engagement photos very very soon and we couldn’t be more excited. Since we will be receiving our photos in a couple of days, we have been brainstorming about our save-the-dates! 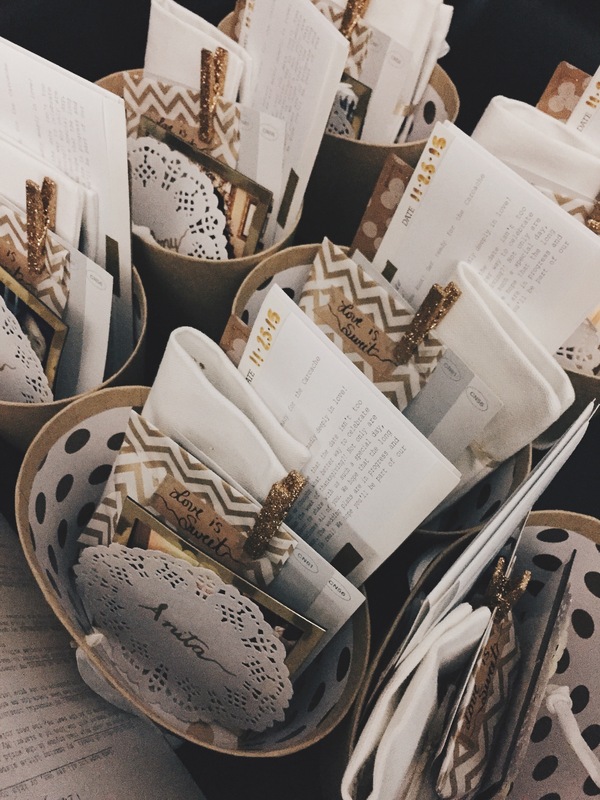 We previously blogged about ‘minted’ and their lovely sample wedding package we received. Well, we have been trying to weigh out our options and what will both be economical for us and give us what we want. So, we have also received a cute sample from Wedding Paper Divas. Pretty soon, we will be scratching that off our list and I have to say, we are pretty close to making our decision once our engagement pictures get to us. I can’t contain my excitement! 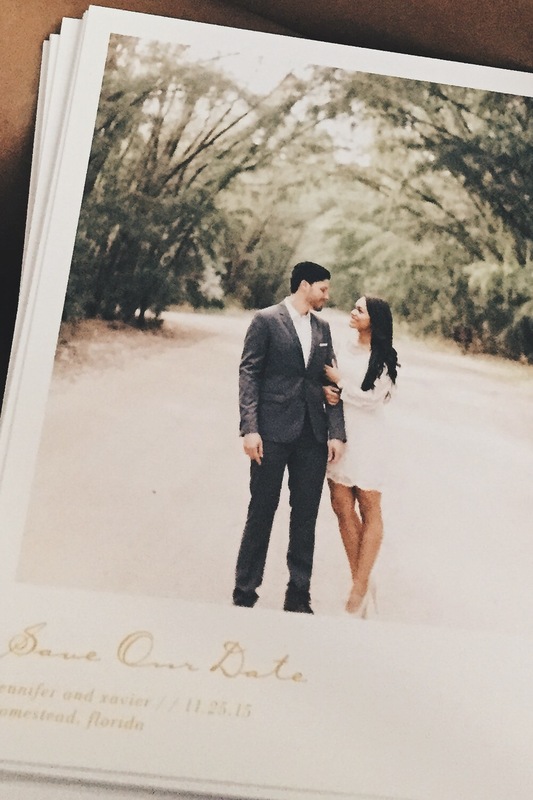 Check out Wedding Paper Divas and their invite samples… cute right? 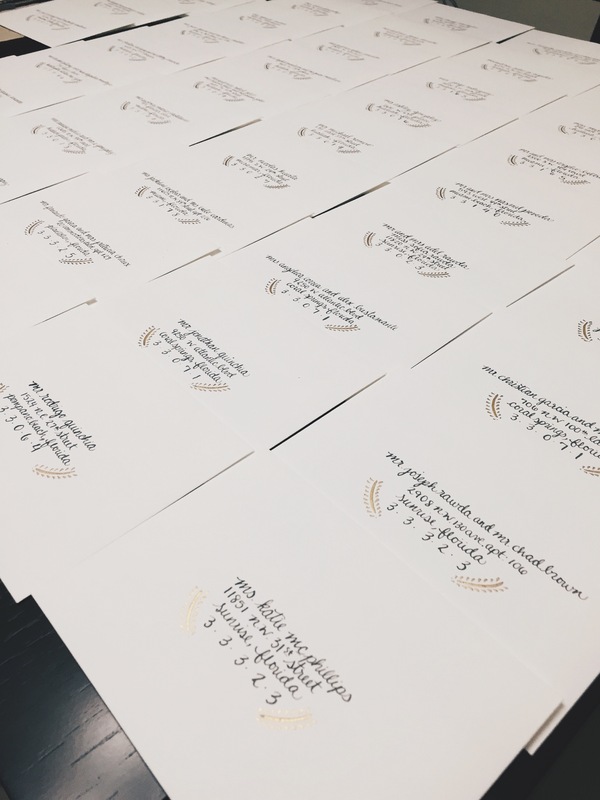 We’d love to know if any of you bride to be’s have used Wedding Paper Divas for your save the dates or invites?! How are your list of to-do’s looking? Saying “YES” to the Dress! One of the most special moments that will forever be imprinted in my memory! On this Wedding Wednesday, I want to take it back a little, to about two months ago when I said “yes” to the dress. After the holiday’s had passed, I decided that it would be a good time to “start looking” for a dress. Yes, I said ‘start looking’.. mostly because in my mind, I thought things would go a lot different. And what I mean by that is.. time! The time it took me to find MY dress, was definitely less than I had originally planned for. Originally I had thought, “Ok, Jen! Its time to start the search, because knowing me, I won’t be able to decide”.. Those were my thoughts exactly guys. My thoughts played a little trick on me that day.. I had made two appointments for the day for a start. Little did I know ONE would have been good enough. 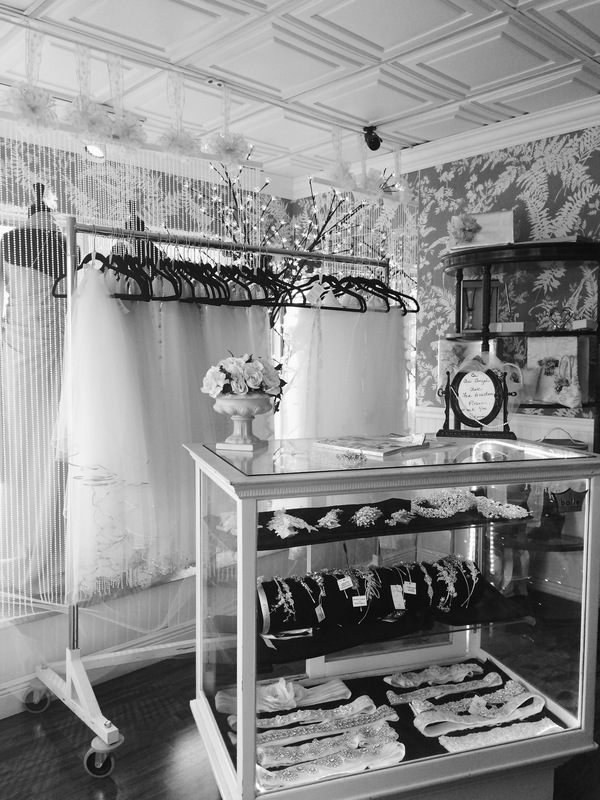 My appointments for that day included two places; First being Patricia’s South Bridal, a cute little boutique in Ft. Lauderdale that I had known through my brother and from high school. It was the place to go to for prom dresses, lol. Second, David’s Bridal, I had nothing to lose. Going into the appointments, I was nervous, yet very excited. 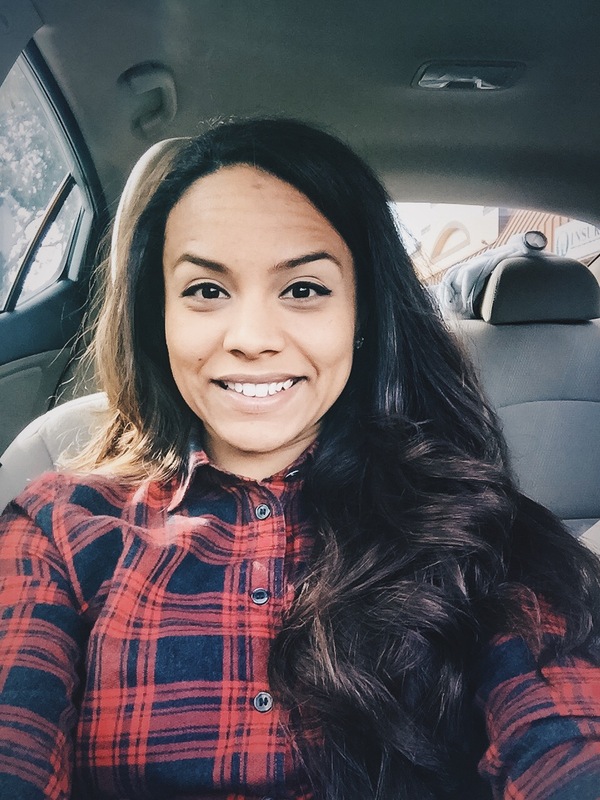 Nervous because I knew I had a budget that I was very adamant about not surpassing, especially that my fiancé and I are paying for our wedding. And of course, I was excited, excited because well I had never tried on a wedding dress and I knew at the moment that we walked into the store, that we were there for MY dress! That day I decided to take with me the most special and closest of friends with me. Not all could make it to both appointments, but spending the day with all them even if it wasn’t all together made my day sooo special! It meant the world to have them all there. I was seriously overwhelmed with joy, seeing all my girls there. The first appointment was amazing, most of my girls made it to this appointment with the exception of a couple and it was the start of a very special two hours. The appointment started in the cutest little ‘tea room’ where my bridal consultant asked me the famous questions… “whats your style?” “what do you see yourself wearing?” “poofy not poofy?” “Veil?No veil?” the list goes on… up into everyone’s favorite question..”what your budget?”sigh… well as anyone that’s getting married can tell you budget is a big deal! Well after I had told my Bridal consultant the ultimate answer of the budget, and how adamant I was about sticking to it, my lovely girls brought the champagne out to start the festivity and the search! Little did I know, my mom and dad had a little surprise I had no clue about. Right before the toast, My mom stopped and told me that her and my dad had a surprise me… well that’s when she leaned over and whispered to me that her and my dad were paying for my dress!… How grateful I was for that gesture is beyond what words can describe! Of course the tears flowed, but flowed with joy! We are so incredibly blessed for all the support we have received from all our loved ones through this journey. The Dress search quickly started and my amazing bridal consultant April started to put me in dresses! The best part of trying on dresses for the first time is seeing everyone’s faces when you come out and the second is seeing how what you may have hated or loved, doesn’t always go the way you thought. 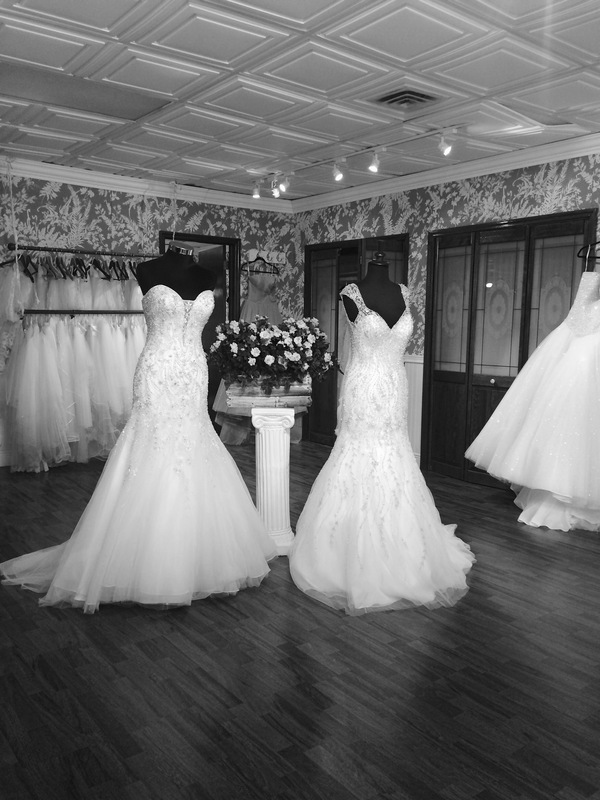 My advice to any bride looking for a dress… Be OPEN MINDED and be willing to try dresses on. Half of the time, the way they look on you is completely different from what you thought when you see the dress on the hanger. Well long behold, there were ‘nice’ dresses, ‘pretty’ dresses, ‘okay’ dresses and there was a ‘LOVELY’ dress. Everyone always ask, “did the dress make you cry?””Did you get the feeling?” Well, I can now describe the ‘feeling’ most talk about. From all the dresses I tried, I always looked to mostly one person for confirmation, and that person was my momma. 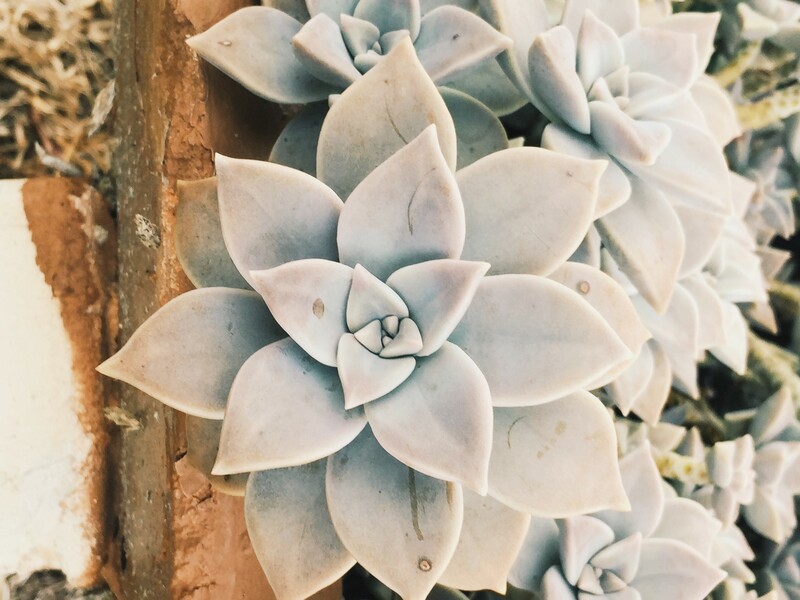 She liked a lot and thought many were pretty.. But how did I know that my dress was “the dress?” I knew, as soon as my mom got up from her chair, her eyes glowed, touched the dress from head to toe.. telling me how beautiful I looked and that she couldn’t believe it. I knew it was my dress when she stared into my eyes and cried with the biggest smile on her face. When her and my little sister reached over to me and gave the biggest hugs full of joy and love. And when I looked behind them to see my future mother in-laws face, lit up with a smile and tell me that Xavier is going to love it..and that I looked beautiful. That’s how I knew that my dress was “the dress.” Most girls, not all.. I realize this.. but most girls, look to their moms for that last confirmation.. and well, that’s me. I knew that if my momma loved it and made her get up from her seat, and my mother in-law also loved it and knew her son would too.. that, that was my confirmation to say “yes” to the dress. Did I cry? Yes. I didn’t cry because of the dress, no. I cried because of the moment the dress brought upon us. It’s a beautiful dress and I wouldn’t want to wear any other dress. But I cried because I could see myself walking down the aisle to my future husband in that dress and i could see my mom on the side with tears of joy and confirmation. All those thoughts plus my overjoyed mom hugging and fixing the dress and how lovely the dress is.. Knowing that’s the dress I would walk down the aisle with, is what made me cry. 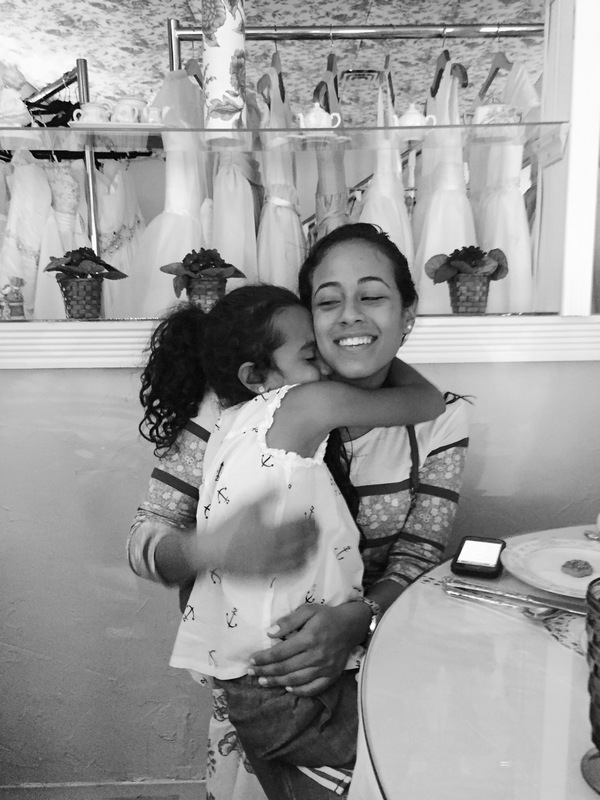 Yes, we went to Davids Bridal after that appointment, mostly because I wanted to include those who couldn’t make it to the morning appointment and to confirm that Yes, I had picked the dress. Do I wish I would have kept looking for more dresses at different places? My answer is NO. I knew from the moment we had found my dress, that it was the dress. The dress I LOVED and would wear the day we get married. And while many tell me, you should have looked a little more, because ‘you never know’… I had already set my mind. If I absolutely LOVED my dress, saw myself walking down the aisle in it, my closest friends and family loved it and had such a sweet lovely and personal moment with my family.. why would I? Another tip for advice, don’t be too influenced by others, go with your heart. It makes the moment that much more special! 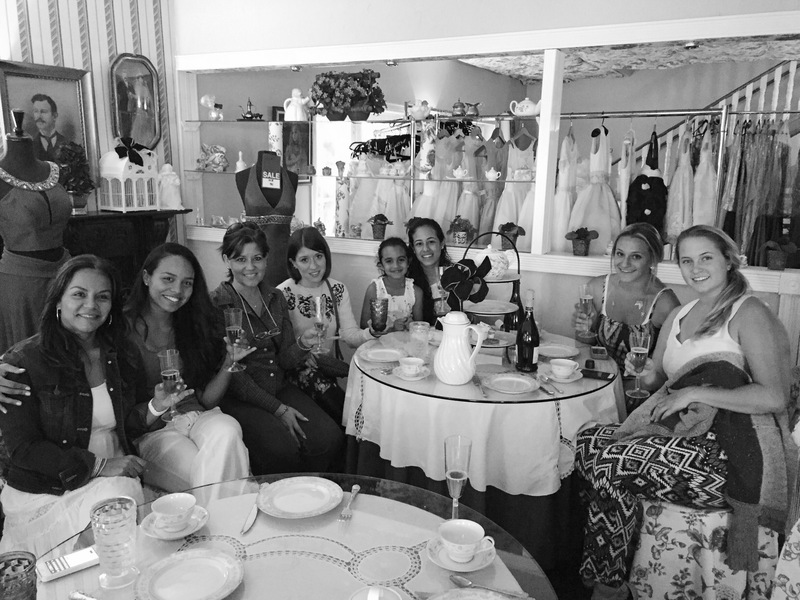 That’s how I said “YES” to my dress..
My girls with the exception of some, thank you ladies! How cute are my Maid of Honor and Mini-Maid of Honor? And to make my moment that much more special, my brother Joe also played a big part of my happy day… to my surprise he had also made a contribution to my saying “yes” to the dress.. Thank you Joe and to my parents for your endless efforts in making my memory the best one! You all are my happiness and Im so grateful for you all. 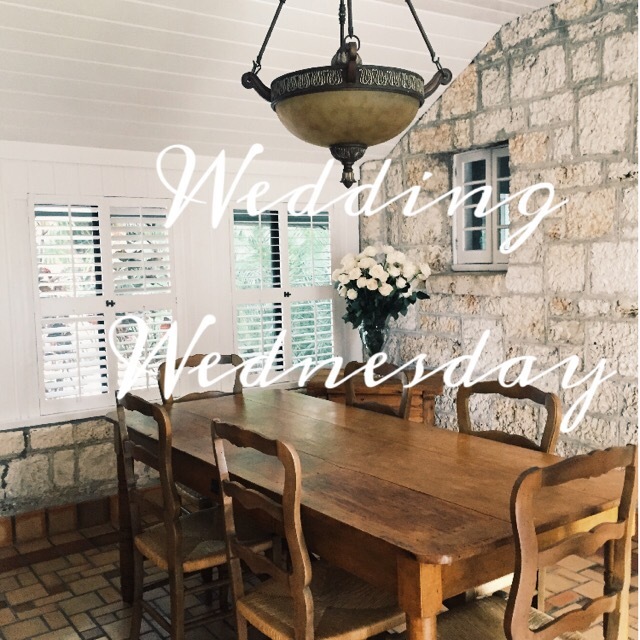 Happy WEDDING WEDNESDAY!.. 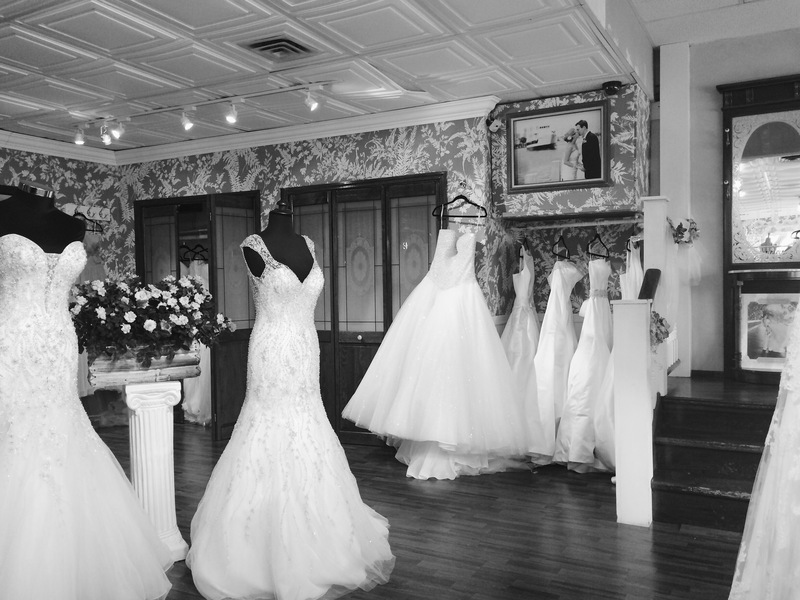 How sweet is your memory of finding your wedding dress?